Things come around, as they say. Sometime in 1988, as a Geology graduate student on my way to my field study area near Bishop, California. 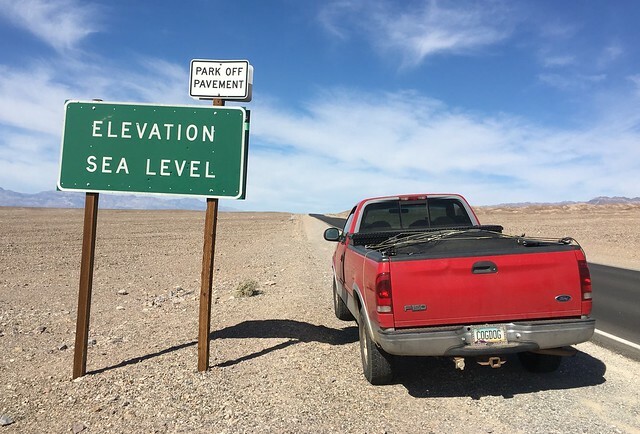 I drove through Death Valley, with likely the obligatory photo of my car at the Sea Level sign. That was driving my 1973 Ford Maverick and a photo taken on film with my 35mm Nikon Nikkormat. I had no phone with me on that trip. This time it’s me still driving a Ford, but now a 1988 Ford F-150 and the photo taken with an iPhone 6. 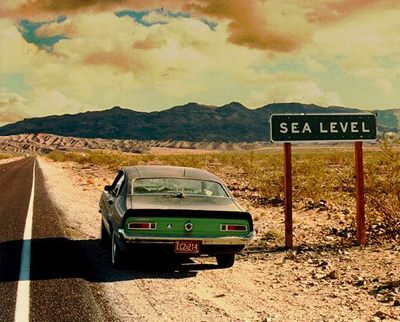 I am not quite sure it’s the exact spot, there are a few places the highway passes through sea level. In the 1988 photo you can see the Mesquite sand dunes in the background. The exact location does not matter much, I was there both times. This all triggered an Amazing Story of cover art. When I started working as a green ed-tech for the Maricopa Community Colleges, I digitized this photo with a scanner, and it was sitting on my web directory as a file named sealevel.jpg. A German pop band named The Sea Level, contacted me years later asking permission to use it for the cover of their CD. This is the Internet I still love. That IS an awesome album cover shot. They must have been stoked to find it.